From violent street protests ... This clipping is from a Jan 2007 protest in Puchong organized by the Opposition, the year before Pakatan Rakyat seized Selangor from the BN. ... to token, boardroom resistance. I'm guessing a lot of people didn't know that the Selangor government had shares in three toll concessionaires, namely LDP, Kesas and Sprint. I just found out about it, too. No wonder lah the toll issue wasn't turned into too big a deal by Pakatan's politicians, especially those governing Selangor, during the last General Election. 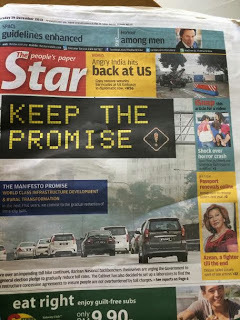 Before 2008 when they were the Opposition, the same politicians would stare the cops in the eye and go to jail to oppose not only the increase in toll rates but the idea of toll itself. Now, Selangor MB Khalid Ibrahim says he will instruct the state's business arms PKNS and Kumpulan Perangsang, who are substantial minority shareholders in the 3 concessionaires, to resist further toll increases from next year when the companies bring the matter up. He is quick to cleverly add, though, that the directors concession companies will have a final say, meaning to say the state's business arms should not be blamed .. [Pakatan and Toll: From violent protests to token resistence]. "We feel that the returns to PKNS are good enough and do not have to be increased through toll hikes. We do not have to take advantage to reap more profits just because" ... wait for it ... drum roll ... here it comes ... "the federal governmnent failed to ensure a good cash flow". In other words, the MB is saying that the state government did, indeed, "take advantage to reap more profits" since 2008. R-Way: Koleksi Cerita Merepak Terkait Jalan Toll Gua Baca Hari Ini. 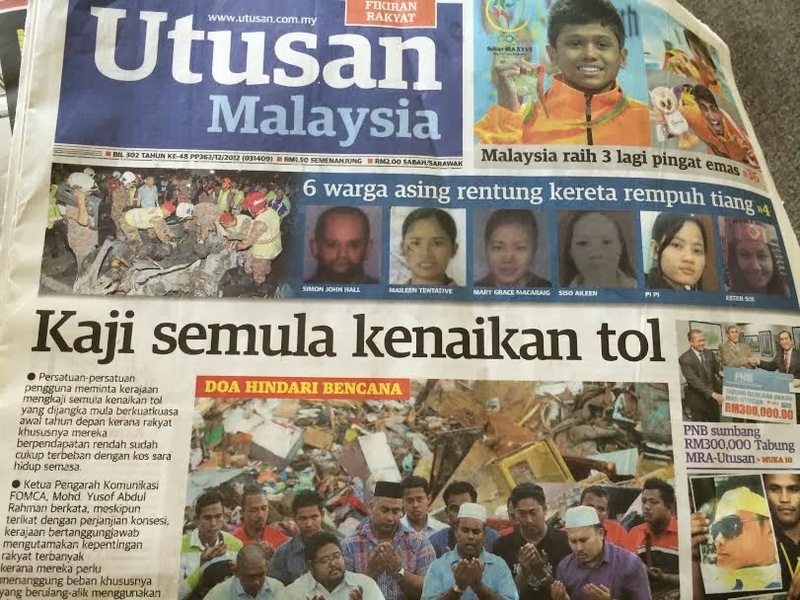 After all, even pro-government dailies like the Star and Utusan Malaysia are taking up the mantle! Lato, you are damn good in twisting and spinning story. If Selangor with 30% stake is guilty of allowing the toll hike, so what happen to federal gov which got higher stake? It is better be late than never. "Gradual reduction of intra-city tolls" was one of the promises in BN's so called "aku janji" manifesto for GE13. All kinds of populist promises were made before elections to trick the gullible voters. Now that they have "won" as the minority government, they repay us by showing us their middle fingers. Vote for BN somemore lah ! if protests are necessary, then protests should be directed to all the companies, especially thye biggest one, PLUS. Being mnority shareholders in LDP et al, you seriously believe they can dictate terms? If they could, I believe they would, unlike the Federal Governmnt, which could but would not. Tak usah bimbang, rakyat Malaysia. Pilihan raya udah lepas. Saya sebagai PM aman dan sihat. Juga saya harus mengucapkan terima kasih kepada bini saya atas kerjasama dalam urusan kerajaan dan dikatil juga. Kepada semua lapisan rakyat Malaysia, kenaikan tol, elektrik, cukai pintu, petrol dan sebagainya, bukan tanggung jawab saya satu orang sendiri. Jika rakyat tak mampu, kurangi pakai elektrik, gunakan jalan alternatif, jangan pandu kesini dan sana utk menjimatkan petrol, kurangi makanan terutama gula agar sihat dan gembira. Duit yang dikutip dari kenaikan semua servis dan barang, akan dibayarkan terus kepada kementerian2 tertentu dan juga Kon-sultan yang kita mengupah membuat rancangan sejauh 1,000 tahun dari sekarang. Wah, hebat UMNO. Saya tak ambil satu sen juga. Jangan marahi saya, rakyat yang disayangi sekali. Kita jumpai dalam 4 tahun nanti. Pada waktu itu saya akan terus menepati janji UMNO dengan pengumuman BR1M akan naik sebanyak RM999.99. Sokonglah BN, sokonglah UMNO. Tak ada UMNO, orang Melayu terus buta, tak mungkin maju. UMNO adalah pembela orang Melayu supaya mereka terus kekalkan dikampung yang mereka sukai selamanya. If this is the best possible "damage control" / spin that's available on this issue, then Barang Naik better start thinking of more devious ways to stay in power. I'm sure they are already. But on a more positive note, this blog gets another Green Dot! It's all your fault Rocky and those of you who voted BN..PR already say will abolish tolls when they come to power but you fools still wanna stick with BN..
And you fools still wanna ask apa cina mau..
Maybe the cinas are more pragmatic then you all..
And please dont say cannot be done and bankrupt the country excuses..so far Selangor and Penang not bankrupt yet and doing better then last time..
Blum cuba blum tau..sudah cuba hari hari mau..
Next time give PR a chance..
Dato' minta tolong dedahkan, kalau kerajaan negeri pegang 30%, 70% selebihnya siapa pegang? Siapa pun tak boleh buat apa. Politicians are all the same, right, left, centre whatever... They think only in RINGGIT and anything that benefits their coffers. See how these PR goons defended their lying state representatives to the extent even the lies are stucked to their arseholes. They twist the issue and blame the federal government when the Selangor MB knows very well the imcomes from the 30pc shares is lucrative enough to fill up the state opposition coffer. Lies and deceptions are the opppsition's game plan and they have their cybertroopers to execute it. Its all about affluents bro! indeed they gain from Umno that they slashed, almost all the time. Rezeki terpijak, they say. 1. Umno/BN must stop all the mega projects. Bumi Empowering is a must, as described by Datuk A.Kadir Jasin. Everybody prospers. Let it for the next four years. Rhetoric/wordcraft isnt good for transformations anyway. 2. Let the oppos builds their infrastructures. No more easy access - Wakil (Setiausaha dari Persekutuan). All federal projects on selected blueprints only. 3. PM Najib, please find places in the heart of rakyats. Too much sways, might break some groups of the holding cables... those cable cars (dreams) may plunge to pieces ! Putrajaya's privatisation exercise is under scrutiny again after it confirmed a hike in toll rates next month, with analysts saying the public has to pay the price for such lopsided concession agreements. They told The Malaysian Insider that Putrajaya's past mistakes have come back to haunt it as the agreements were legally binding and toll hikes were part of the deal – and however the government pitches the case, it has to give in to the concessionaires. Some 15 highways will see toll increases of between 50 sen and RM2, but the government has yet to announce the final rates. The hike comes on the back of higher electricity tariffs and proposed pricier assessment rates and public transport prices in Kuala Lumpur. "If you sign an agreement, you have to stick by what you have signed," National Economic Advisory Council economic consultant and banker Syed Akbar Ali told The Malaysian Insider. "If you oppose price hike, then why did you sign the agreement?" Akbar was referring to Barisan Nasional's (BN) election manifesto, where Datuk Seri Najib Razak had promised that intra-city tolls would be gradually reduced over five years. "He is the PM, yes. But with what authority did he promise that? An agreement, which is legally-binding, has been signed." Bad for Malaysia if Najib did not hammer through hike? RAM Holdings Bhd group chief economist Dr Yeah Kim Leng, adding that if concession agreements were broken, said the government's credibility and the country’s credit rating would be at stake. "Of course the government can use its influence to ask these highway concession companies to be more accommodating in toll hikes," Yeah added. The economist, however, called on Putrajaya to look into the issue "case by case" to see which highways were profitable and which were not. "Hiking up toll rates on highways which are congested and are making money because of the high volume of traffic is not really justified." He said this would then give Putrajaya the higher ground to "persuade and renegotiate" with highway concessionaires not to raise their toll rates. Akbar said Putrajaya should be more careful in signing agreements in the future to avoid issues of toll hikes at a time when escalating living costs followed price increases in petrol, sugar and other items. He said: "One of the conditions they should include is, as the volume of traffic increases, the increase in toll should be lower. And toll increment should be pegged to the amount of money concessionaires owe to banks. "Also, the length of the concession periods should also be looked into as some of them have long concession periods." PAS Research Centre executive director Dr Dzulkefly Ahmad said Putrajaya had been "more than merciful" when it signed deals with the highway concessionaires and water supply companies. But he said the government must be able to renegotiate for a shorter concession period and for a stop to the toll rate, as the agreements were based on the forecasted volume of traffic to use that particular highway. "On urban highways like the New Pantai Expressway and Kesas, the traffic would have been more than they expected. "Thus the Internal Rate of Return of 15% would have been achieved much earlier and they would have recouped their investment," Dr Dzulkefly said. Penang chief minister Lim Guan Eng had also previously blamed the impending toll hike on the "lack of integrity" shown by the federal government, citing the failure to practice open tender in awarding projects had led to lopsided concession agreements. "The companies are only collecting net profits from the toll collections, minus maintenance cost. We are against this proposed hike. But since such an agreement had been signed, the people will have to bear with it." Dr Dzulkefly said relooking the concession agreement is one way of protecting public interest. "But it is obvious now that the government are more interested in guarding the concessionaires who are cronies of the BN government. "Details of the concession agreements must be disclosed as it involves the greater interest of the rakyat," he said. The number of vehicles in Malaysia is rising each day, which subsequently means that more customers for toll operators that lead to more profits even if the toll rates remains. Therefore, according to PAS vice president Tuan Ibrahim Tuan Man, there was no need to increase toll rates as the number of vehicles on road keeps on growing each year. “Why there are parties who make agreements based on time to collect tolls? Because this does not meet the objective of having tolls collection,” said Tuan Ibrahim in a Facebook positing. He said tolls collection was supposed to be a tool for return for investment for investors and also making decent profits. “For such businesses where profits are almost guaranteed, by right the agreement should be done based on the amount of profits to be made from the investments. For example, if the investment is RM1 billion, then the profits can be limited to RM3 billion before the tolls are abolished at the same rates throughout the tenure,” he suggested. Time-based toll collections, he said, would prolong the lifespan of tolled highways and it was also considered as a form of oppression for road users as “roads would be more congested” due to rising number of vehicles despite paying more for tolls. “The decision to hike tolls rates is due to the mistake of those who made the agreement by giving two obscene profits – one from tolls rates hike and also from the rising number of vehicles. Don't forget LGE objection of and promise of no toll. Suddenly when he sees the benefit, he claims he will have toll with similar charges including any interest for the Penang tunnel project. What hypocrite this LGE is. At least they are doing something that might affect the decision on toll hike. Better than the Federal Government where mysteriously every time toll concessionaire need to raise their toll rate, they become so power less. Kangkang saja dan terima....tak melawan sikit pun. 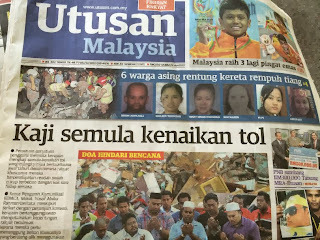 Padahal BN bila cakap pasal ketuanan melayu, islam Sunni atau Shiah, Perlembagaan negara pun boleh ditukarkannya. Isn't the now Selangor's MB one of your own kind ? So go easy and watch what you are saying. Datuk, what you have said that minority shareholders, however substantial, CAN actually have final say in the management of any business is a big slap on the face to all companies in Msia bcoz all minority shareholders didn't know about this power until now...thank you Datuk for bringing this up to our attention.We minority shareholders had been taken for a ride far too long by those greedy majority shareholders.